Saturday afternoon Dawn and I did the Division poster route, which, St. Patrick's Day, ha ha, wow. I had no idea St. Patrick's Day was like that. But it was only hairy in the bars, and the hairiest in Mac's American Bar where you can hang your poster on the bulletin board by the bathrooms, so fighting through a sea of green that has to pee really bad. After doing our leaguely duties, we picked up the sweetie man and took the Ashland bus to Fullerton and walked over to Pizzeria da Nella. 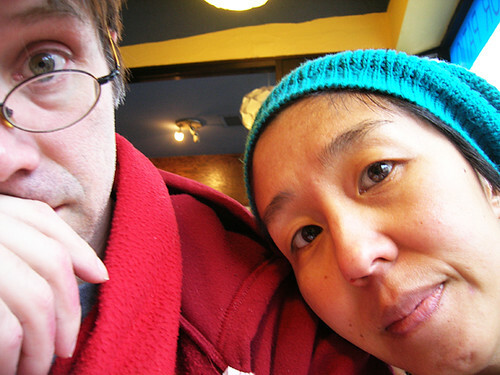 Me and the sweetie man. 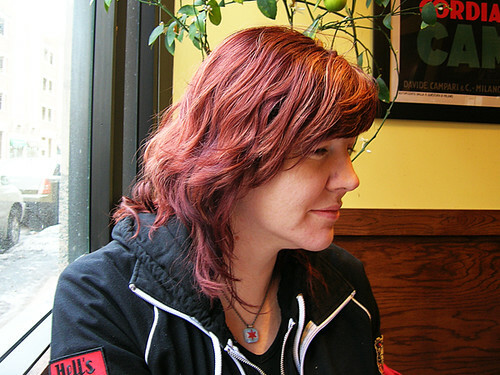 Dawn has a new haircolor, isn't it nice. Pizzeria da Nella Cucina Napoletana is located at 1443 W. Fullerton Avenue. Pizzeria da Nella is very nice, a restaurant restaurant, where you get bread for starters, and also I ordered a nice mixed green salad with cherry tomatoes and black and green olives, and also also Italian craft beers were had by all, two blondes and one brunette. The sweetie man did not like his blonde, so I traded him my brunette and he was happy with that. The blonde was a little on the hoppy side, I don't think he likes that. I like it all right, I'm not too picky about my beer and really generally like beer with pizza. 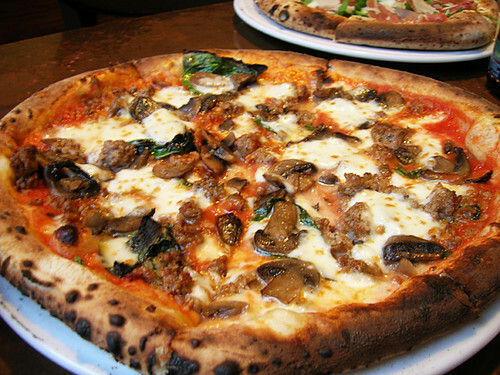 Red pizza with funghi and sausage, whoop, not the funghi in the review. 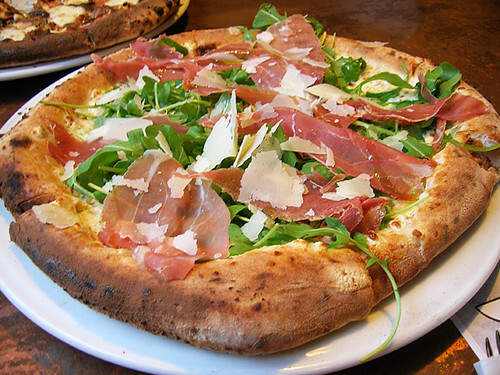 White pizza with prosicutto, parmesan, and arugula. I guess I'd say this pizza was not bad on the Munt scale. Do you know the Munt scale? It goes good, not bad, not half bad, I suppose there's also not half good but that's like vosotros in Spanish, rarely used, and then not good, and bad. And so far I've been saying everything is good, right? Not bad is not bad, you know? I think the crust is the same style as the Coalfire pizza we had a couple weeks ago, a thin crust that gets fired in a fancy oven. Hold on, let me actually check....... yes, both Coalfire and Pizzeria da Nella are Neopolitan style pizza. So I've been thinking about my crust words and I decided that "bready" means like bread, you know, American bread, like it has a crumb, and "blistery" is like naan bread, thin and stretched out and, well, blistered. Are you with me on this? So like Coalfire was a perfect blistery crust. The crust at Pizzeria da Nella is blistery too, but not as blistery, and turns into bready around the rim. I think also the middle of the red pizza crust was a little bit soaked. I mean, that happens. (Not at Coalfire, though, they just put a shmear of red sauce on their crust.) Also I ordered a different funghi than was recommended, so we may have missed the boat on that. The white pizza has no tomato sauce, just cheese and then whatever toppings. We got the prosciutto, parmesan, and arugula, I liked that a lot. I feel like that's the first time I've tasted prosciutto on its own terms, perfectly thinly sliced prosciutto sitting on a cheesy blistery crust with some sprigs of fresh arugula for contrast. And now MJ has a prosciutto tooth, I have to source some more for him.